If you are looking for information on the Smart Tax franchise business opportunity, Smart Tax franchises or Smart Tax franchising, then you have come to the right place. "It's time to take your life back. It's time to change your future." Smart Tax was founded on knowledge, experience, training and years of hard work in financial planning, taxes, insurance, and more. The first Smart Tax location opened in 2005, after the need for a professional, convenient tax preparation services to local communities was identified; shortly thereafter, the business began to expand to multiple locations. Looking for the opportunity to be your own boss, and create your own destiny? Does your time at work far outweigh your free time? Feeling the need for greater independence in your personal and professional life? 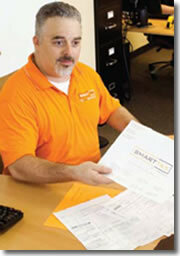 Let us help you change your future by introducing you to the Smart Tax Franchise program. Smart Tax is a business ownership opportunity that differentiates itself from the rest, by delivering top-quality, professional services, while allowing you to focus more on quality of life. And, it allows you to own a tax preparation business without requiring a background in finance, accounting, or tax law-it's a business that is easy to start up and operate, just by following the established and comprehensive Smart Tax system! Professional training, both at our corporate headquarters and at your location, to ensure you have the knowledge you need to open your doors for business. Plenty of start-up assistance, from choosing your location to assisting you in real estate support, including purchasing the right equipment, furniture, and systems. Guidance on marketing to your local community to get taxpayers to your door. Ongoing remote and onsite support during and after tax season ... and so much more! We will provide ongoing support services to you by phone, email, and periodic onsite visits to your location. Plus, we regularly update our operations manual with new procedures and other information designed to improve operations for all franchisees. We are looking for candidates who have an aptitude for client service and an attention to detail; management skills are also important. We are looking for franchise owners who are capable of opening and operating both single and multiple locations. However, it is not necessary to have previous experience in tax preparation. Regardless of your skills or background, we will provide the tools and training you need to run your own Smart Tax locations. Now is your chance to become part of the Smart Tax franchise system and bring this incredible concept to your community. Get started now by creating a satisfying and rewarding experience for you and those around you!